I love December! I love the holidays and I love that it's super close to my birthday! Woohoo! Anyways, I think I'm going to start a series of Christmas/Holiday inspired nail art. First up is Snow Globe! 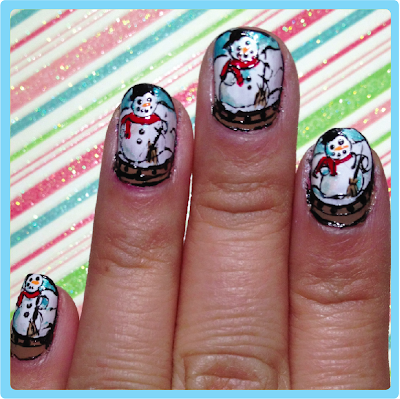 This was one of the holiday nail art I really wanted to. 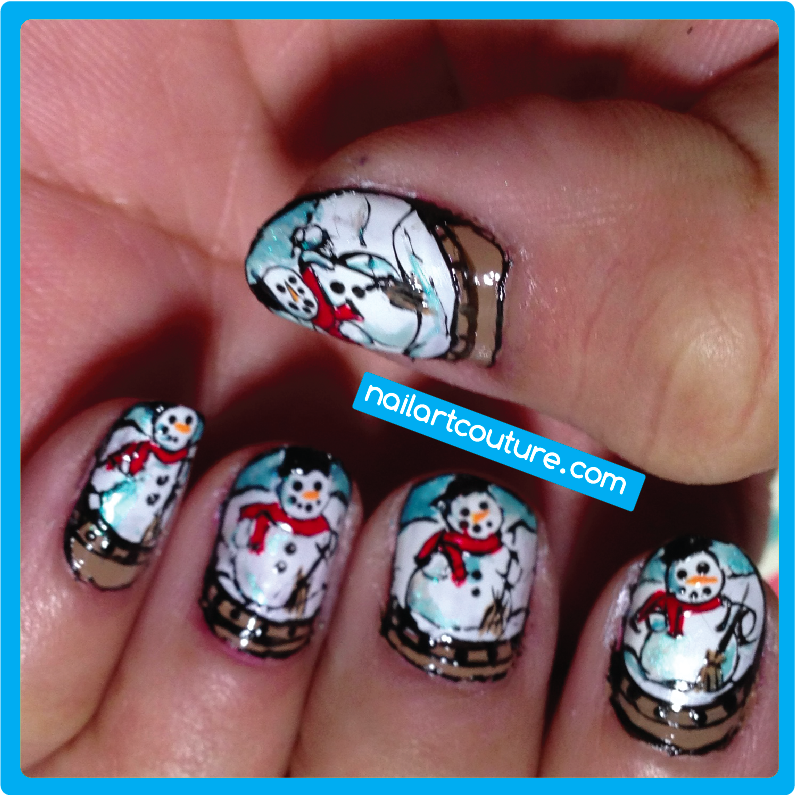 I was googling some snow globe nail art some of them didn't look like snow globes at all! There are a lot of amazing christmas nail art out there, so here's my version! This is first of many, so stay tuned! An optional step is to either add a glitter top coat into the globe (not the stand) to replicate a snow when it is shaken. I didn't add that step in just because I like to maintain the details of the image. With my tutorial, feel free to be inspired by customize they way you like it. Check out the tutorial after the jump! Use the curvature of tip, attempt to create a round circle. Fill in the unpainted area with brown polish. If your circle is less that perfect, use the brown polish to fix it. 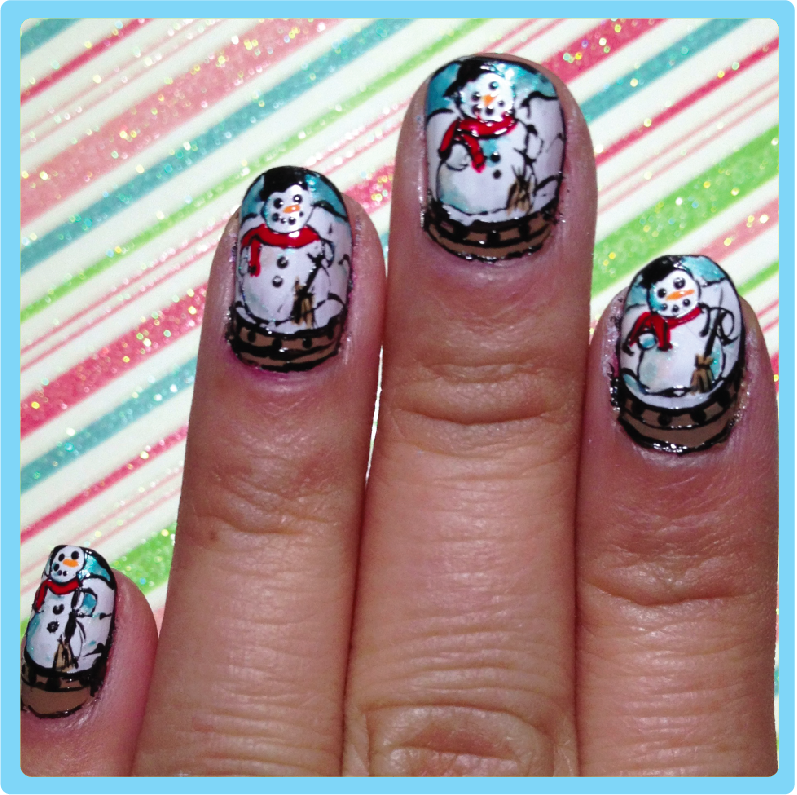 With a black polish and a nail art brush, create the outline of a snowman. You can do three circle snowman or you can try to recreate the outline in the picture. Add in the top hat on the snowman's head and outline for the snow. Next add in the details. Using a dotter, create the black eyes and smile. With the orange polish, create a small line or best attempted triangle to create the nose. Mix the opalescent polish with a bit of blue polish. Outline different areas of the snowman to represent the shadows. Next add a little more blue polish to the opalescent top coat to create the sky. Fill in about 1/4 of the tip. Using red polish, add in the scarf on the snowman. Add in additional detail and touch-ups. Create a brown triangle at the bottom of the snowman. With black polish, add the in the bristles and the handle. Next out outline additional area of the snowbank, scarf, globe, and stand. Next add in extra details to the stand. I chose to do a simple design with black bolts. Optional: Add in glitter top coat to the globe to replicate snow flakes. I hope you like my first of hopefully many christmas theme nail art. If there are any christmas nail art requests please let me know! Be sure to check out my new nail art shop www.nailartcouture.bigcartel.com and if you wish to have a customize set or recreate a past nail art that I've done, send me an email for a quote! Wow! I am impressed, they're so evenly done that I initially thought they were deals. Thanks! People usually do. I guess that means I'm improving my art! That is insane! I can't believe you did that by hand. are u ambidextrous or what?!!! these are insane!!! REALLY LOVING THIS!THE BEST SO FAR!! Sorry that I keep commenting on a bunch of your posts, but I just found your blog and you have amazing nail art! When I saw the first picture, I thought these were nail stickers! It's amazing that you did all of this free hand!